Posted by Morgan in G20, tcktcktck, Uncategorized. “Ooooh, its hot in here! There’s too much carbon in the atmosphere!” rang loudly over the 10,000 strong protest in downtown Pittsburgh. 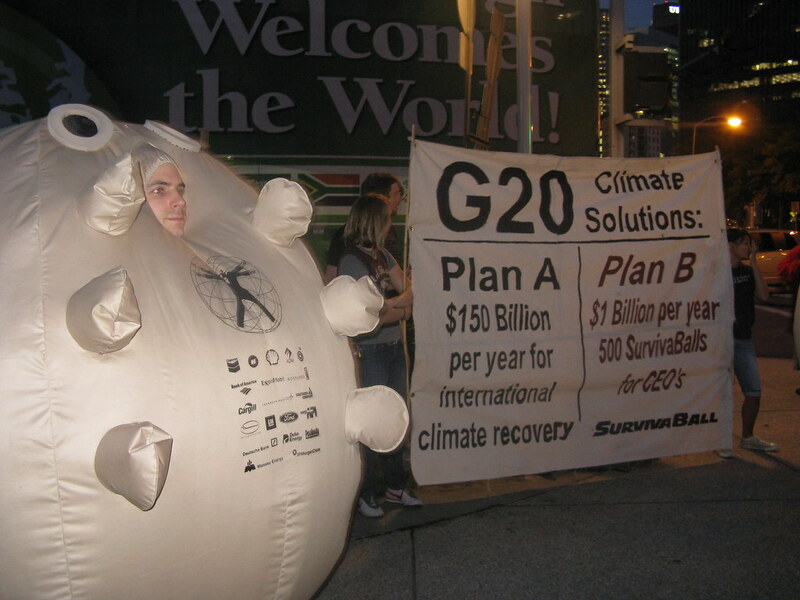 With our huge banner reading “Copenhagen or Bust”, the 11 climate activists that are the Climate Action Factory were right in the thick of the G20 action. Getting to this rally in downtown Pittsburgh with a banner in our hands and the 300 person strong climate contingent we had helped to organize was the result of weeks of work, dozens of sleepless nights, long planning meetings, and an unbelievably intense drive to get a fair, ambitious and binding global climate treaty. 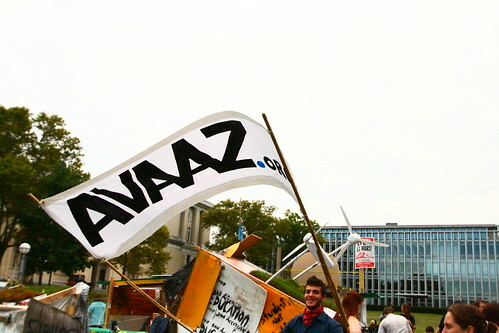 The Action Factory, or AcFac, is sponsored by Avaaz.org, a global campaigning network advocating for a wide range of social justice causes. We are a group of climate activists who plan and execute actions – anything that will get us a better climate treaty in Copenhagen. 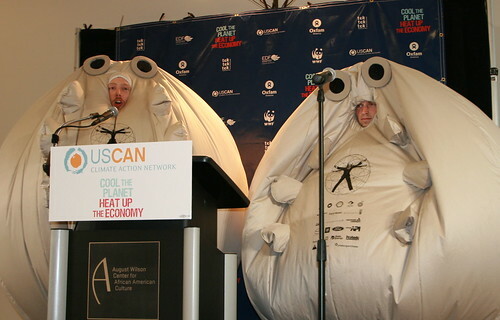 The Action Factory’s work in Pittsburgh was part of Climate Week, the global mobilization for climate action hinging on two major meetings of world leaders: the UN General Assembly special meeting on climate and the G20 meeting on global economic recovery. With both of these events, global civic society hoped for major progress toward the road to Copenhagen and a global climate treaty. 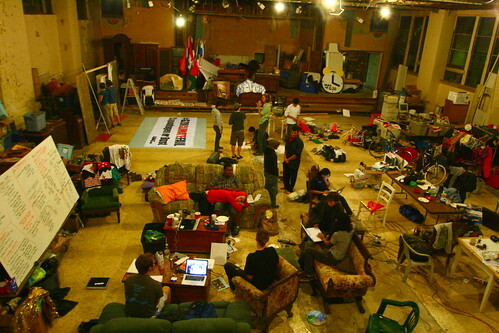 Our home base for Operation Pittsburgh was an old church, rented on the cheap. Thanks to the previous owner, the place was a visual assault on the senses. 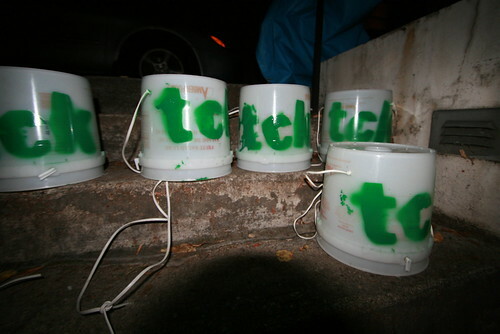 Stacks of large tupperware filled with clothes and knick-naks teetered against all 4 walls. The space turned out to be ideal. 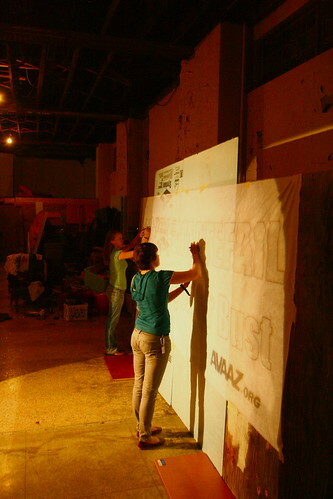 The church was huge – a key criteria for making banners and signs, as well as housing lots of fellow activists. The stuff inside also proved inspirational. A dozen buckets? Great, drums for a march. Stacks of racy posters for an army surplus store? Instant material for all the signs and posters we could ever need. Climate week – Day 1: The Action Factory kicked off the G20 protests in Pittsburgh by hosting a climate wake up call on Monday, September 21st, the first major action of the week. Our Pittsburgh wake up call was one of over 1,800 events held worldwide. 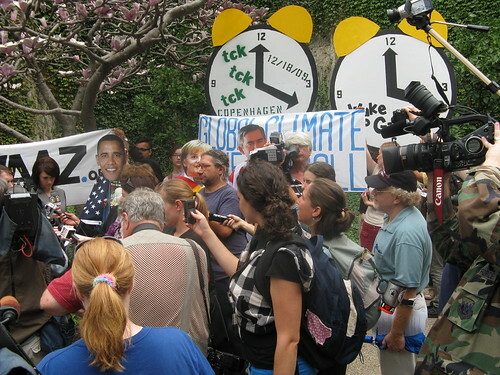 The action plan entailed scores of people gathering on the corner of 7th and Penn in downtown Pittsburgh, all with their alarm clocks set to 12:18pm (the last day of the climate talks in Copenhagen). At that time the alarms would ring, and the crowd would rush forward to “wake-up!” the sleeping leaders. 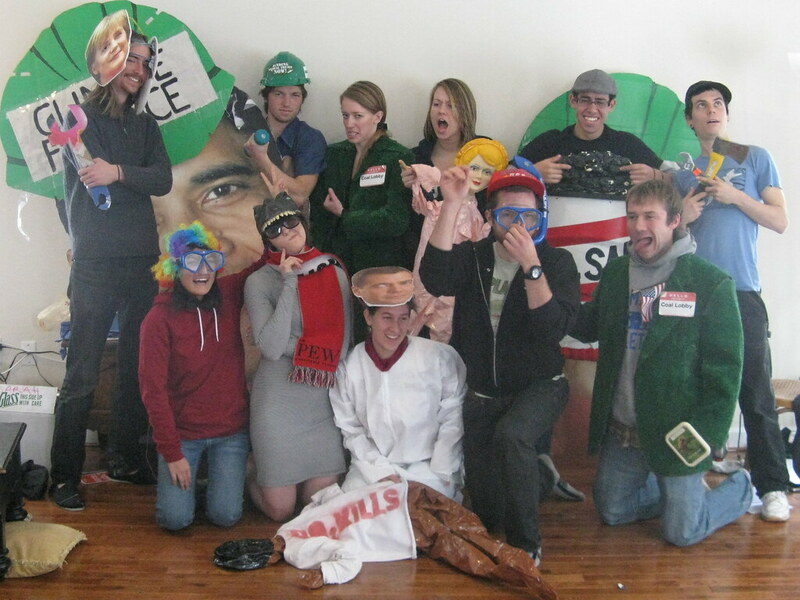 As a rapid-response group, we’re used to plans changing at the last minute. The previous day Gordon Brown upped the ante by committing his attendance to the UN climate change talks in Copenhagen, being the first major head of state to do so. We excitedly amended our action to feature not just President Obama and Chancellor Merkel, but also threw in Prime Minister Brown. Suddenly our wake-up call was both a big stunt, and a breaking news conference! As it approached noon, more people gathered on the corner. The media, initially 3 TV vans, had grown exponentially, fascinated by the preciseness of a 12:18 action, and eager for the first ‘G20 protest’ story. At 12:15 a masked Obama, Merkel, and Brown laid down in the park with their nation’s flags as blankets. The clicking of cameras in combination with reporters attempting to elicit soundbytes out of the sleeping actors was so great that it almost overshadowed the cacophony of alarms at 12:18- but not quite! The AcFac’s Morgan Goodwin led the gathered masses in chanting “wake-up! climate action now!” as the leaders awoke and sleepily rose to their feet-and to the occasion. He thanked the crowd for gathering and gave instructions on how to call our President and Congress to demand bold climate action domestically and abroad this December in Copenhagen. We further thanked Gordon Brown for rising to this unmet challenge. The wake-up call was a huge success! Locally we had a ton of success and globally the impact was huge – leaders of Spain and Australia answered calls with no prior planning, and a London resident talked directly to Prime Minister Gordon Brown–on national television! Our own footage of the event was streamed in the global premier of The Age of Stupid that night all over the country. Climate week – Day 2: While the pols in New York talked a big game at the UN General Assembly, coal was getting down to work in Pittsburgh. An international coal conference butted right up against the G20 in both time and place. The city teemed with finance ministerial staff and diplomats preparing for the G20 who couldn’t help but bump shoulders with coal engineers, carbon capture and sequestration researchers and other dirty energy enthusiasts. That’s a little too close for comfort. The Action Factory jumped at the chance to publicly shame the CEO’s and politicians attending the CCS tour through what would be our highest risk action yet. Considering Pittsburgh spent $30 million dollars to bring in additional police and military reinforcements, every direct action had an elevated risk- but even more so when involving civil disobedience. To pull something off at the scale we were aiming for less than 24 hours after the wake-up call, preparation commenced immediately and lasted well into the early hours of Tuesday morning. At 8am a group of activist allies began assembling at a nearby park in the rain making banners and signs denouncing the dirty lie of clean coal. The street protest was part of the plan to catch the media and coal enthusiasts before they got on the bus, therefore delaying the tour. 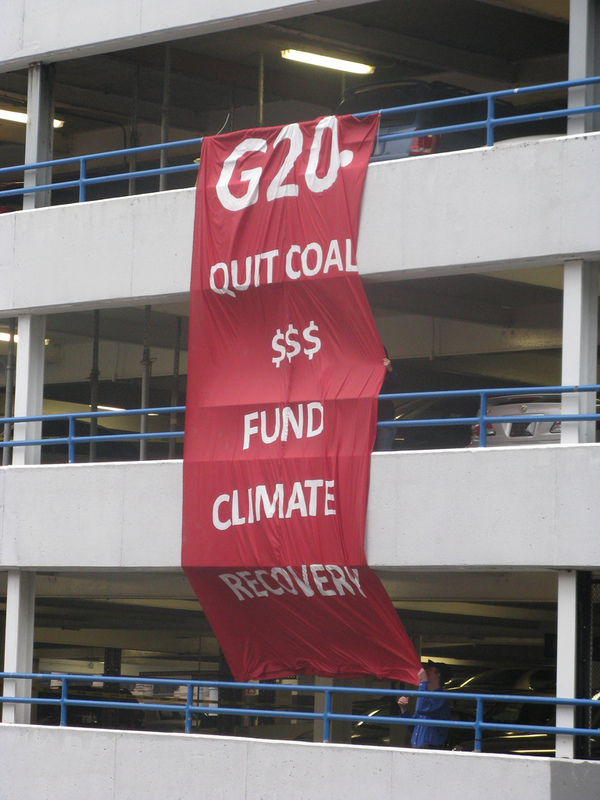 Just as reporters and politicians filed onto the bus, we flipped a 30′ banner over the parking garage side to loud cheers from the activists and the embarrassment of the attendees of the international coal conference tour that sent our message loud and clear: “G20: Quit Coal $$$ /Fund Climate Recovery”. The banner unfurled just as TV crews were filming a spokesperson for the coal industry attempting to defend industry practices as activists held a ceremony on the sidewalk to apologize to the coal for extracting it and promise to keep it in the ground. While the banner drop was no easy feat and was certainly an elevation of our direct action tactics, we walked–or rather, sprinted–away from the experience with more confidence for the rest of the week and for our return to DC, ready to take on international climate politics. Climate week – Days 3 and 4: With all the coal hacks running around, and traditional protesters cordoned into official ‘protest zones’ in the militarized downtown, the AcFac decided that maybe we could team up with some corporate partners. I mean, any solution to climate change is a good one, right? Thanks to our (ahem) partners (ahem) at Exxon-Mobile, Duke Energy, Chevron, BP and Shell, we were able to bring a more reasonable climate solution to the G20. 6 demonstration SurvivaBall (TM) Model X7s debuted at the Clean Energy Jobs rally Wednesday night to promote our climate plan. For those not familiar with SurvivaBall, a project of the Yes Men, you can read all about the product, watch the CNN footage here, and watch the infomercial here. Hard working Ac Fac members then helped the SurvivaBall (TM) sales executives with a formal Pittsburgh product launch and even infiltrated the belly of the G20 summit to help spread the message: While $150 billion/year isn’t that much money to help the world’s poorest overcome climate change, we could spend so much less money on protecting the world’s richest! And we wouldn’t have to change how we do business either! Climate week – Day 5: We were appalled at the lack of ambition on climate from Obama and Merkel, the two critical leaders in the final leg of the road to Copenhagen. The Action Factory organized a climate feeder march all the way from Carnegie Mellon University to downtown, joining up with the People’s March on the way. 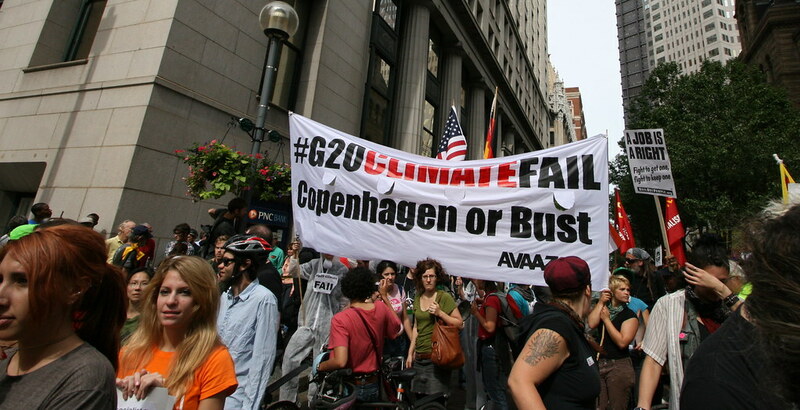 To convey this disappointment, our huge march banner read “#G20CLIMATEFAIL / Copenhagen or Bust!”. Of the six publicly scheduled issue-specific feeder marches, the Climate Justice feeder march was reportedly the largest and certainly the most energetic. Our crowd spilled into the streets, to the dismay of the police, and swelled in numbers as we collected people along the route. Multi-issue mass-mobilization marches tend to be a flood of messages, but our succinct messaging paired with visual cohesiveness broke through the clamor.The New York Times picked up on our precision, featuring our banner in their photo-story on the protests. And the AFP syndicated this story around the world, using Avaaz’s frame of the summit to describe the climate outcomes. Not to mention our quote in Chinese press, for Chinese readers. The Action Factory rocked Pittsburgh. For our part, we had significant influence on media framing in the days leading up to the G20 along with Greenpeace (who also pulled off a bold banner drop) and our other allies from the 3 Rivers Climate Convergence. Despite the fact that Pittsburgh stalled and withheld march and camping permits to undermine mobilizing efforts, the turn-out was impressive: the largest permitted march pushed 10,000, and the largest un-permitted march peaked around 1,500. In the face of massive military buildup, fear-mongering, and police violence, protesters who came to be heard at the G20 counted many tactical victories and left stronger than they came. The world needs a fair, ambitious and binding global climate treaty this December. We’re not messing around here. And as activists dedicated to the cause, its time to pull out all the stops and keep building this campaign to win. Take action, join the global conversation, and work these next few months like you’ve never worked before. We are. Posted by Morgan in copenhagen, G20, tcktcktck. Check out the highlights reel from the DC Action Factory’s work in Pittsburgh! Big props to Sarah Murphy for her hard work on pulling this together. Posted by skolmk in copenhagen, G20, tcktcktck. 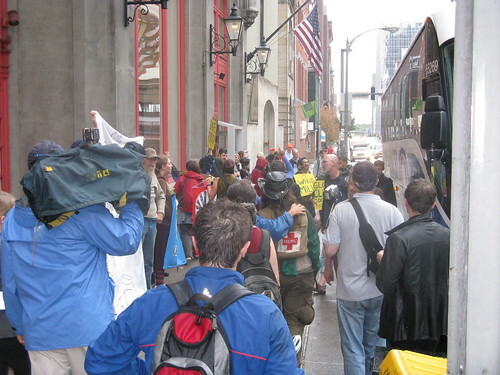 PITTSBURGH, PA 9/22/09– Activists unfurled a 30′ banner as international coal conference attendees departed for a tour of a carbon capture and sequestration test facility. The large banner read “G20: Quit Coal $$$/Fund Climate Recovery”. The banner unfurled at 9 AM on as 20 coal conference attendees boarded the bus. A spokesperson for the coal industry tried to defend industry practices as activists held a ceremony on the sidewalk to apologize to the coal for extracting it and promise to keep it in the ground. The activists are connecting the dots between dirty energy companies and the obstruction of the global climate and energy treaty process. Organizers of today’s action oppose false solutions to climate change such as clean coal, industrial bio-fuels and nuclear power. Instead the group promotes truly renewable energy technologies and local solutions as part of a fair, ambitious and binding global climate treaty. On the G20 negotiating table this week are hundreds of billions of dollars for economic recovery and climate solutions, which world leaders will bargain and haggle over. Activists fear some of that money will pad the coffers of the coal industry. The presence of the coal conference in the same city, earning the attention of government officials and policy makers is a vulgar affront to genuine progress on climate change. The coal process has major impacts at extraction, processing, burning and waste disposal, according to the Sierra Club, the nation’s largest and oldest environmental advocacy organization. The group sites clear cutting, erosion and subsistence leading to property damage as side effects of mining, and respiratory diseases from air pollution. It cites mercury levels in breastmilk, destruction of whole ecosystems when miles of streams are covered with mine waste as water issues. According to the Club, coal is also not the source of employment it usually claims to be. “Estimates of mining production and working coal miners show that between 1985 and 2005 mining production in the US increased 22%, while the number of coal miners decreased by about 55%.” The average income of coal miners has also declined over that period. Today’s activists sent a bold message to the G20: it is past time to quit their addiction to coal and other destructive energy. Check out footage of the banner drop and the press conference intervention here. Posted by Morgan in G20, tcktcktck. G20 Leaders are likely to miss the boat on financing climate change financing. We welcome them to prove us wrong, because tomorrow we’re going to be marching on the G20 summit and bringing this message to them. This week we’ve seen Gordon Brown commit to going to Copenhagen and helping to finance climate adaptation. Japan’s new government has announced more ambitous climate targets, and China and India have come out with bigger cuts. German Chancellor Merkel and US President Obama are holding the rest of the G20 back when it comes to a fair, ambitious and binding global climate treaty. Rich nations need to commit $150 billion in public money per year to help the poorest people avoid the worst effects of climate change. Gordon Brown has called for $100 billion, and the EU’s target is even more ambitious, but those ambitious goals are being blocked by the US and Germany who are wary of putting any numbers on those goals. We call that an epic G20 Climate Fail. Copenhagen is just a few months away – what do they think they’re going to do? Push it back and hope climate change slows down a bit? We’ll be marching, and we need you to be helping push the march along, making it more than just a physical march, but also a digital one. The process of making amazing banners. The church, where we’ve created our actions. 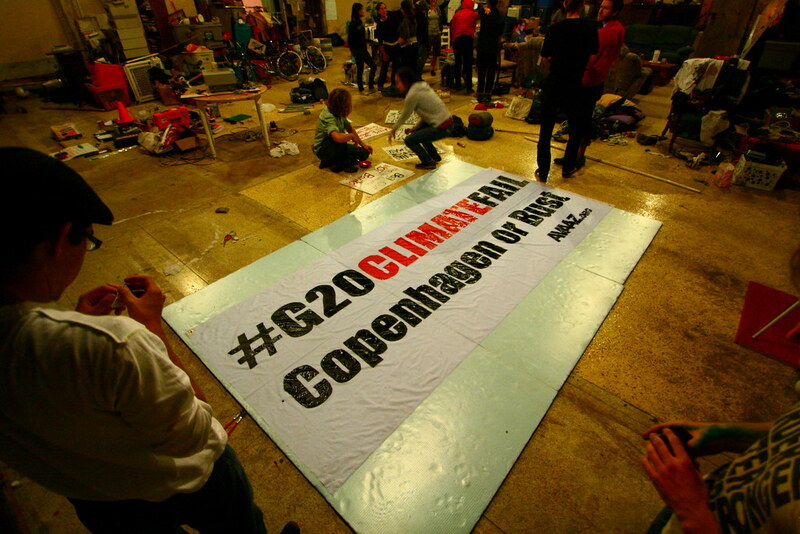 Posted by skolmk in copenhagen, flash mob, G20, tcktcktck. This morning brought big news that shook the tone and message of today’s wake-up call: Gordon Brown upped the ante by committing his attendance to the UN climate change talks in Copenhagen, being the first major head of state to do so. Luckily the Action Factory was awake early, diligently preparing ourselves for the days’ event. Our original action was planned to feature four world leaders, none of which included Prime Minister Brown, until the news broke. We excitedly shared the news amongst ourselves, and amended our action to feature just President Obama, Chancellor Merkel, and Prime Minister Brown as the world leader’s asleep on the job- but now with an added twist. Arriving to the location of our event, I grew excited seeing three different TV stations already set up and speaking with our media. The event grew larger as time passed, with more and more reporters looking to find out what had brought so many dedicated citizens to this park corner on a Monday afternoon. At 12:10 I put on my robe and crossed the street with our version of Gordon Brown (I wore the Merkel mask), and we met up with our President Obama and laid down in the middle of the park, snoring loudly while the world waits for international climate action. The photographers and cameras gathered around, clicking away so loudly that I wouldn’t have been able to sleep on the job even if I wanted. At 12:18 exactly the alarms sounded, and we were quickly surrounded by masses yelling “wake-up! climate action now!” Myself and the other two leaders rose to our feet, and instructed the crowd to call our Senators and our President, carrying out a literal call for strong climate action this December. We further thanked Gordon Brown for rising to this unmet challenge. The media was as abundant as the participants, and we ended by walking to one of Pittsburgh’s historic and iconic bridges to take one last group photo. This event was covered by many media outlets including live TV broadcast which you can see here! Our own footage of the event will be streamed in the global premier of The Age of Stupid tonight, another massive wake-up call event. So much excitement, and to think- it’s only the beginning of the G20 week. Stay tuned and stay safe.